When the House of Tomorrow was completed in 1933 it gave visitors a sneak peek at the shiny, optimistic future that was to come—all twelve sides of it. Today, this relic of the 1933 Chicago World’s Fair sits in disrepair. But preservationists are hoping to change that with the announcement of a new campaign to restore the house to its former glory. 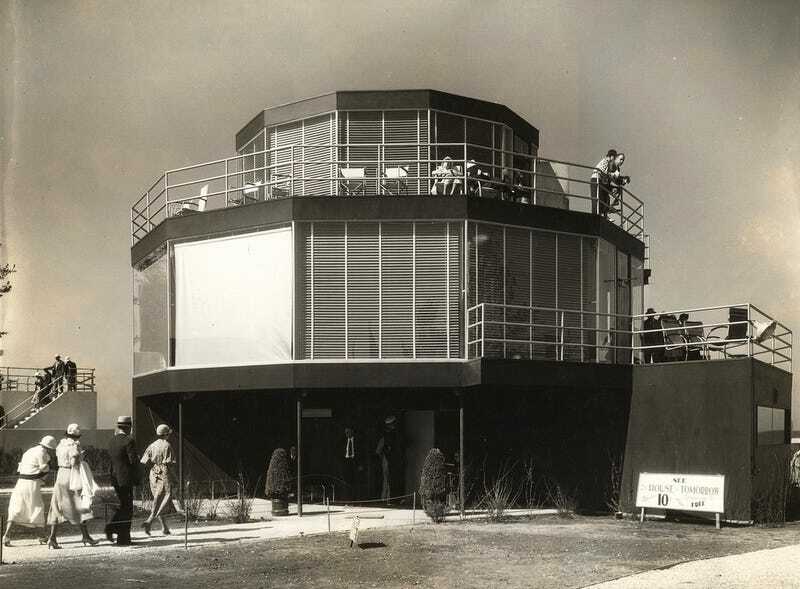 The National Trust for Historic Preservation has declared the House of Tomorrow a “National Treasure,” and the Indiana Landmarks organization plans to raise $2 million to preserve the house. Technically, the house is now property of the National Park Service and has been since the 1960s, but budget cuts for maintenance of historic buildings have left the House of Tomorrow neglected. “By declaring it a National Treasure, we have the opportunity to save the House of Tomorrow while also honoring its legacy of innovation,” David J. Brown of the National Trust for Historic Preservation said in a statement. Designed by George Fred Keck, the House of Tomorrow was built as one in a series of 12 futuristic houses in coordination with the Chicago World’s Fair of 1933, whose motto was “A Century of Progress.” Despite being geographically separated from the main event, the House of Tomorrow welcomed thousands of visitors just across the border in Indiana. The house had everything from an attached garage that could move up and down at the push of a button to central air conditioning. It even had an airplane hangar. The car that was often parked out front was “streamlined” in the ultra modern style of 1930s futurism. After the exhibition, the houses were moved from their original site near Chicago to Beverly Shores, Indiana. But the House of Tomorrow looks pretty shabby these days. “To guide us through the restoration design process, we have enlisted the services of Chicago architect and former Indiana Landmarks board member Bill Latoza. Although the timetable will depend on fundraising, we hope to get the restoration underway by spring 2017,” Marsh David, the president of Indiana Landmarks said in a statement. Indiana Landmarks is currently raising the $2 million to restore the house and announced that it plans to lease out the house for residential living in the future. If it’s affordable (I’m not holding my breath), sign me up!